These crunchy pumpkin seeds are lemony, salty, spicy and zesty, all at the same time. A handful of these toasted tidbits whets the appetite. In a medium bowl, toss together the pumpkin seeds, lemon zest, lemon juice, salt, cumin, pepper, coriander, chile powder, cayenne, and garlic powder. Spread the mixture on a baking sheet and bake for 5 minutes. Remove the baking sheet from the oven and shake to redistribute the seeds, and then bake for another 3 minutes. Pull it out to shake the pan again. 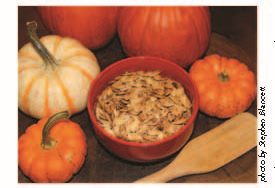 Then finish baking for 1 to 2 minutes or until the pumpkin seeds are crispy and golden without burning them. Transfer to a cool baking sheet and cool completely before storing in an airtight container. This wicked, fresh, piping-hot popcorn is kissed with a simple blend of rosemary, onion, and truffle oil. On medium heat, warm the oil in a large saucepan with a lid. Remove from the stove and add all kernels in an even layer on the bottom of the pan. Cover for 20 seconds to allow all the kernels to become coated and reach equal temperature so they all pop at once. Place the covered pan back on the heat and shake it while it’s on the burner. The kernels will slowly begin to pop; once they start, crack the lid slightly to let out a bit of steam. Continue shaking the pan over heat until the popping stops. Remove from the stovetop immediately and pour all popcorn into a large bowl. Drizzle with truffle oil, nutritional yeast, onion granules, minced rosemary and sea salt. Shake and mix well before serving. Any favorite beer will work. Whisk wet ingredients until mixed well. 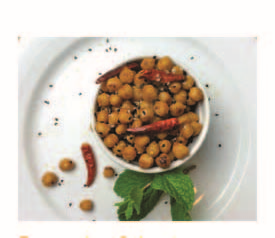 Toss mixture with chickpeas. Place mixture on baking pan and roast for 20 to 30 minutes, shaking and stir periodically until mixture is evaporated and chickpeas begin to get color; beware of burning. Garnish with sesame seeds and dried chili, maybe a little smoked salt. 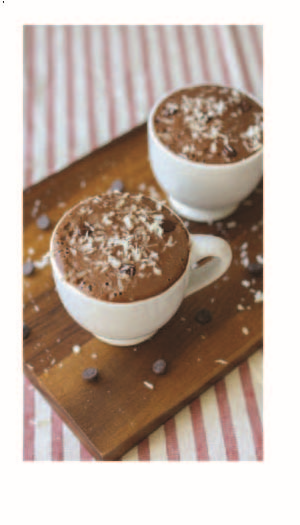 Cozy up and indulge in this thick, creamy and rich hot chocolate made with whole food ingredients. For the pistachio milk, soak the nuts overnight in a bowl of water. Rinse before placing them into a high-speed blender with the 2 cups of water. Blend until the mixture is completely puréed and milky. Strain mixture through a nut milk bag or cheesecloth; then add the nut milk back into the blender. Add all other ingredients and blend at a high speed until thick. Note: If using a regular, slower blender, re-warm the hot chocolate on the stove top. It may not be as thick and frothy but will taste good.